I got my first roll of film back from my used Hasselblad 500c/m. There's good news and bad news. The good news is that the camera works. The bad news is that there's a light leak. The other bad news is that even though #filmisnotdead , #filmisexpensive. I wasn't very methodical in shooting the first roll. I didn't keep track of when I started shooting the roll, when I finished, and what I shot. Unfortunately, that means I'm not entirely sure how many images I should have expected on the Kodak Professional 400TX/120 black and white. I'm sure a quick internet search might give me the answer, but I'll figure it out as I go. You can see the light leak on the left hand side of the images. I got some help from other Hasselblad users in identifying the most likely culprit - the light seal in the dark slide. Here's my amateur attempt to explain the dark slide: it's a metal plate that you have to remove to allow the light to hit the film in the camera (film) back. I think when it's removed it also prevents you from removing the camera back. There is a foam / foil combination in the slot to prevent the light leak. The foam deteriorates over time, thus allowing for the light leak. It should be a fairly easy fix once I've found some replacement foam strips. In the meantime I'll try a piece of electrical tape. Copper Star Coffee, Phoenix, shot on Hasselblad 500c/m. Copper Star Coffee, Melrose neighborhood, Phoenix. 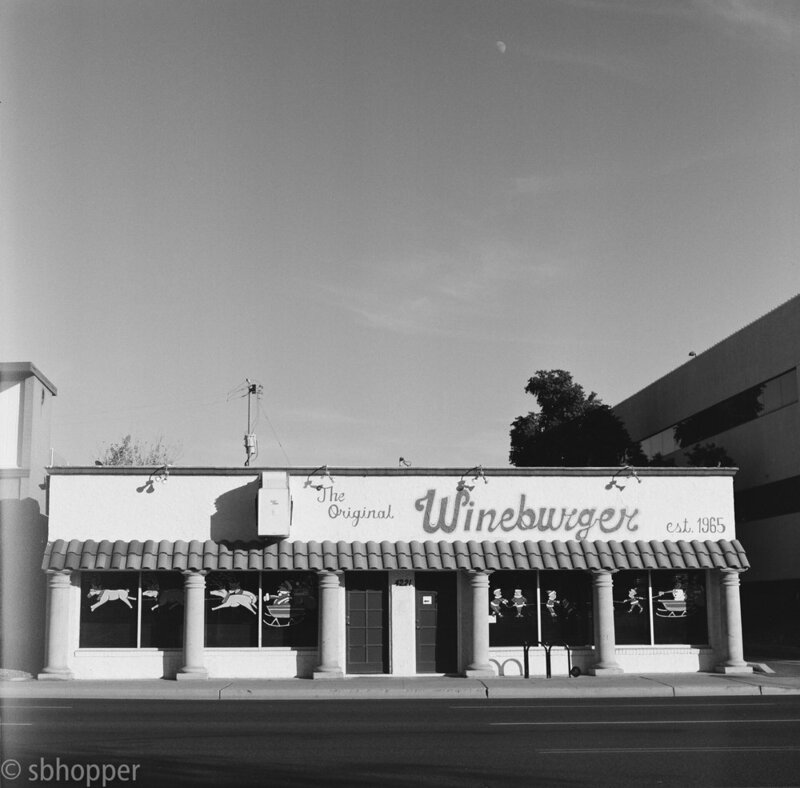 The Original Wineburger, Melrose, Phoenix, shot on Hasselblad 500c/m. This is the third restaurant I have seen in this space. I hope one of the ideas sticks. Analog Coffee, Capitol Hill, Seattle, February 2017. Capitol Hill, Seattle, February 2017.